The idea behind using this new editing technique is when scientists are studying what they call the “non-coding” long stretches of DNA that don’t contain the code for a particular protein; the “shredder” technique could allow them to demolish a sequence of long stretches and see what happens. The “see what happens” is the result of our knowledge of the human genome still remaining small. Challenges with this type of research is to figure out what stretches of DNA have actually been deleted in order to validate the accuracy of the editing technique. Chinese researchers have reported attempting to use CRISPR-Cas9-based therapeutics for editing out a receptor gene that enables HIV to enter cells in the embryos of babies reportedly born in China. Researchers worries concering CRISPR-Cas9 making unintended edits in the normal areas of human patients’ DNA have also been of concern. Further work will be needed to see if the “shredder” approach avoids this issue. 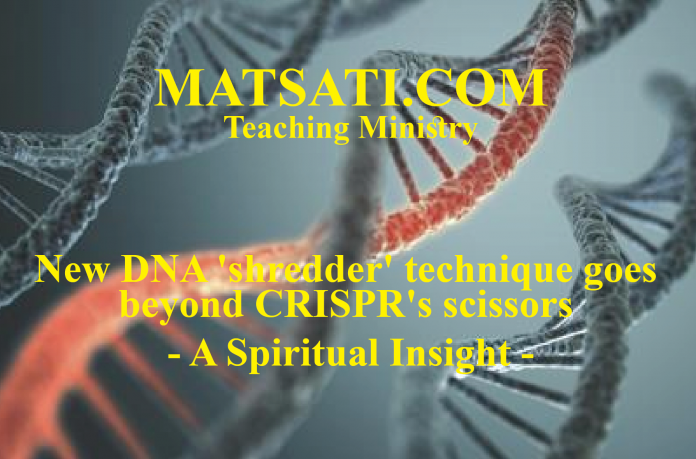 The Spiritual insights that we receive from this work is related to the DNA editing technique. This is connected to the editing technique that many people do in their bibles, considering certain portions of Scripture as irrelevant in relation to others due to presuppositions that have been developed through modern theologies. There are three places in the Bible that describe this idea of adding or taking away from God’s Word. Adding to or taking away will lead to falling out of fellowship with God. What do we see happening today in the modern theologies that are being developed which marginalizes the Torah? We do not see the power of God moving as we once did, and the reason is based upon what we are reading here in the Torah and in the book of Reelation. Sforno states the following concerning the verse from Devarim / Deuteronomy 13:1 (Note, this verse in the English translations is Devarim / Deuteronomy 12:32). לא תוסף עליו, for you might add something which is despicable in the eyes of the Lord. If, perchance, you would add new ways of serving the Lord, you have no assurance that such innovation is acceptable to G’d, for instance the burning of one’s children in G’d’s honour. ולא תגרע ממנו, even if, in your judgment, the rationale for observing the commandment in question no longer applies, is no longer relevant. An example would be Solomon’s reasoning that the restrictions placed by the Torah on the number of wives a king may have did not apply to him as none of these wives could possibly incite him to turn away from G’d. (compare Sanhedrin 21). Sforno writes concerning adding to the Word of God that by doing so what was added will not be acceptable for God. He uses the extreme example of burning one’s children to Molech, a false god of the Sidonians. He also writes about taking away from the Word of God and makes the comparison to the one who considered a particular scripture no longer relevant. Sforno references the Talmud Bavli Sanhedrin 21a and the rabbinic discussion on taking many wives which leads to one turning from the way of God, and the major theme is to what happened to Solomon, a man blessed with great wisdom and yet being deceived due to his political alliances through marriage. This demonstrates how he trusted in the flesh as opposed to trusting in the Lord God of Israel to protect the nation. What is interesting is how this statement was written so long ago and yet is so relevant for us today. Take for example in the nondenominational churches, the dispensationalists “law vs grace” arguments that are made at the pulpit. The challenge for us today is how we live in a culture that does not consider any part of God’s word as relevant and then those who call upon the Lord develop doctrines and theologies to minimize or marginalize the Torah. By doing so, one is seemingly adding to and taking away from God’s Word. The Lord God has told us that we will one day have to give an account of our lives before Him, but many Bible teachers seem to want to leave that part of the message out for fear of offending followers. How much better it would be if they would communicate the life-changing truths that God has given us! The Torah is a text that was written by the hand of Moshe who spoke to God face to face. No other man in all of history ever spoke to God face to face. It can be said with certainty, the Torah is the word of God that was dictated directly from the mouth of God Himself. This is why the Torah is the foundation stone of all of Scripture. God has given us the exact, precise message that we need for life. Because of this, it is impressed upon us to know and to heed every word of the Bible! The Rambam wrote saying, “Everyone who trusts has faith, but not everyone who has faith trusts.” This is a significant point because one may say they have faith or that they believe God’s Word, but it is only when faith is put into practice (faithfulness) that one’s faith becomes evident. When we delight in the Lord by seeking to make His will our highest priority, then our requests will be fulfilled. This is what Yeshua was teaching us when he said “If you remain in me, and my words remain in you, ask whatever you wish, and it will be done for you.” (John 15:7) The essential command that we are given is to “trust in the Lord with all your heart; and lean not unto thine own understanding. In all thy ways acknowledge him, and he shall direct thy paths.” (Mishley / Proverbs 3:5-6, ה בְּטַח אֶל-יְהֹוָה בְּכָל-לִבֶּךָ וְאֶל-בִּינָתְךָ אַל-תִּשָּׁעֵן: ו בְּכָל-דְּרָכֶיךָ דָעֵהוּ וְהוּא יְיַשֵּׁר אֹרְחֹתֶיךָ:) Trusting in God involves translating faith into the realm of action. In every aspect of human life, religious, moral, social, civil, environmental, agricultural, dietary, sexual, and so on, the Torah has a voice on the matter. In the scope of the commandments of God, there is no dividing line between the sacred and the profane in the life of the tzaddik (the righteous). The various commands given to us in the Torah were given because the spiritual realm was intended to permeate every aspect of our lives (1 Corinthians 10:31). The Torah helps us to be mindful of these things, and walking in the ways of the Messiah Yeshua, the Torah commands helps to “wake up” the divine presence in our lives regarding every practical decision that we make. This teaches us how the Scriptures, the Word of God, is intended to awaken us to the reality of God’s immanent presence, He is here, now, and tangible in our lives. When Yeshua was here on earth, he studied the Torah, read the Torah, and clearly taught us to keep the ways of the Lord (Luke 4:16, Matthew 7:12). The point is by the power of God we are no longer enslaved to the power of sin but have a new principle that leads to true freedom, being able to walk in God’s ways by the indwelling of His Spirit. This transforming power of God in the Messiah Yeshua is the Gospel Message that we are being taught in the Torah, and in all of Scripture.